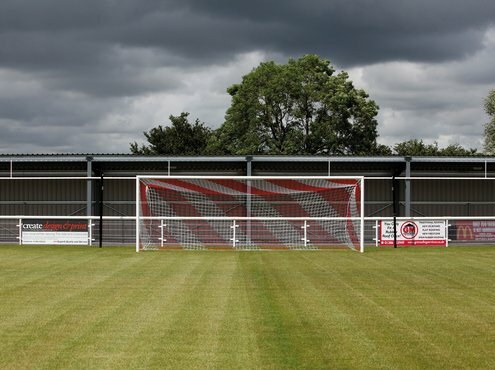 Sitting in one of England's premier fruit-growing regions, Evesham United FC is at the heart of a thriving football community, and its scale of provision may be just about to rise up a couple of notches. 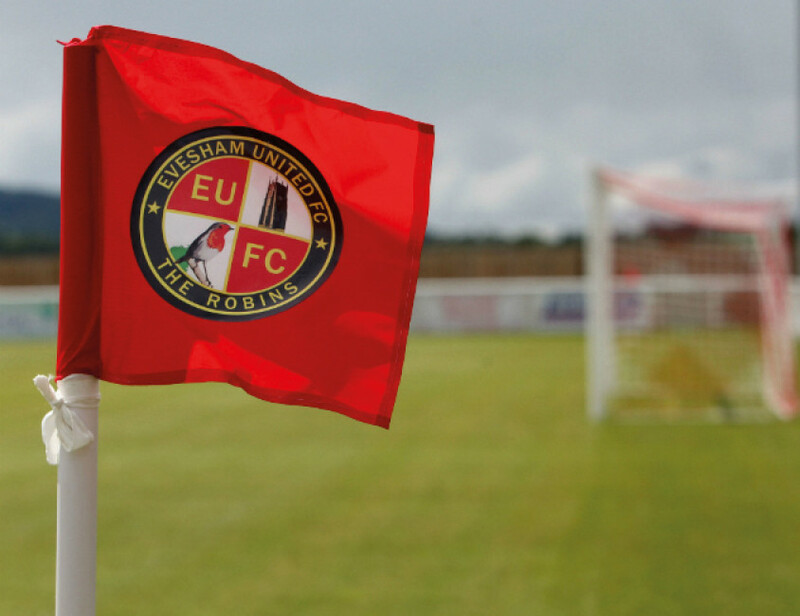 After surveying likely locations for a new 3G pitch, Worcester FA has reportedly plumped for Evesham United for a new community football focus. Revealing this to me is club groundsman Steve Dolphin, in the post for just over a year after his predecessor Nigel Gregg departed unexpectedly. 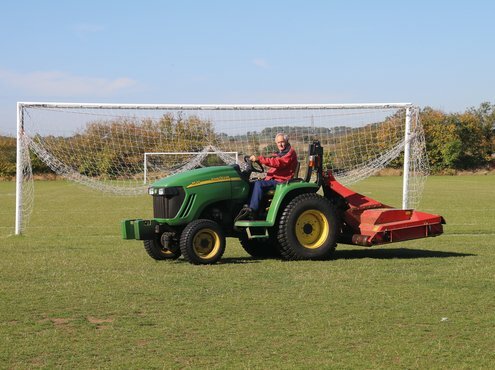 Nigel was a runner-up in the FA's 2015 Groundsman of the Year Southern Football League category in 2015, coming third in the national level 3 and 4 award, which covers the 208 clubs in the Evo-Stik Southern League, Northern Premier League and Ryman League, so Steve is stepping into some big shoes then. "I've come into groundsmanship from the food and catering sector," reveals Steve. "My previous job in a food factory in the area had come to an end and I was stuck for something else to do when the job here came up last summer." Steve relished the prospect of what was advertised as a part-time position. "I saw it as a temporary move and my head said I could rise to the challenge," states the 66-year-old. That part-time role has burgeoned into what is effectively a full-time commitment. "In terms of the hours I do, it is full-time," says Steve. Though a solo groundsman, he works closely with a local sports contractor to help him with the heavier aspects of turfcare. 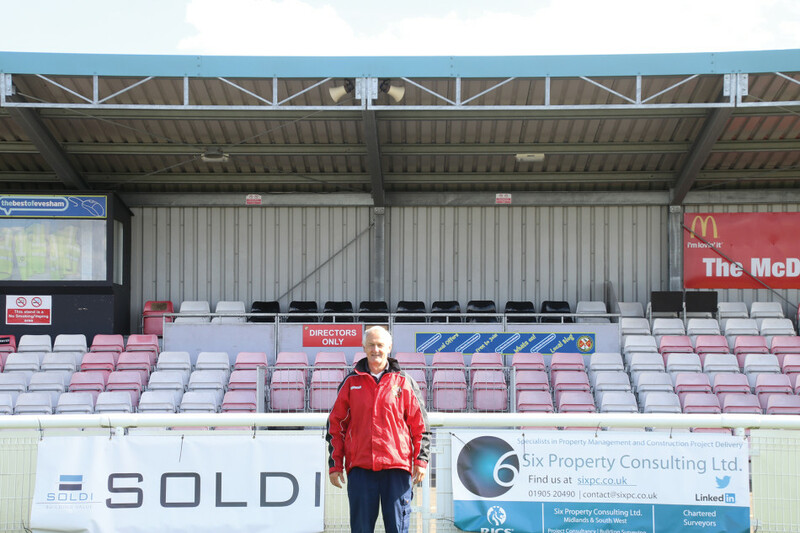 His responsibility rests not only with The Robins' Spiers & Hartwell Jubilee Stadium main pitch, but also no fewer than thirteen others next door. "We have five full-size, six junior areas and a couple of training pitches," lists Steve. If/when the 3G comes to Evesham, that's another level of provision he'll have to manage. "Yes. Schools locally already run artificial pitches, so the choice of where it will land has narrowed to us," Steve explains. 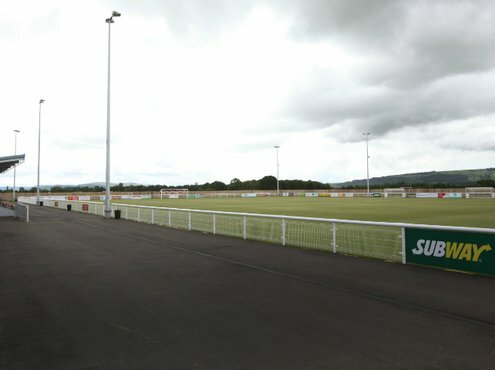 The club maintains the junior and training football pitches for Wychavon District Council and Worcestershire County Council, who own the site. That's not the end of the story though. With flooding of the nearby river Avon a persistent problem, plans are afoot to move Evesham Cricket Club here too, away from risk. "It's sited on the flood plain and sometimes is underwater for weeks on end," Steve explains, "but we're on level land, with no threat of flooding. That will involve creating a brand new cricket square and outfield out of agricultural land." Upscaling of Evesham United's headquarters is in keeping with its footballing aspirations. Topping the Evo Stik South and West Division One at the time of interview, the club is vying for promotion to the Evo Stik Premier Division. World Cup fever as England scaled the heights of achievement, coupled with wall to wall TV coverage these days, has propelled interest in the game amongst the young to unprecedented levels. Evesham is taking full advantage as juniors activity swells under Director of Football Dave Giles. "Our twenty-four teams keep us pretty busy," he states. "We run two weeks of trials in the summer, then invite juniors to join us." 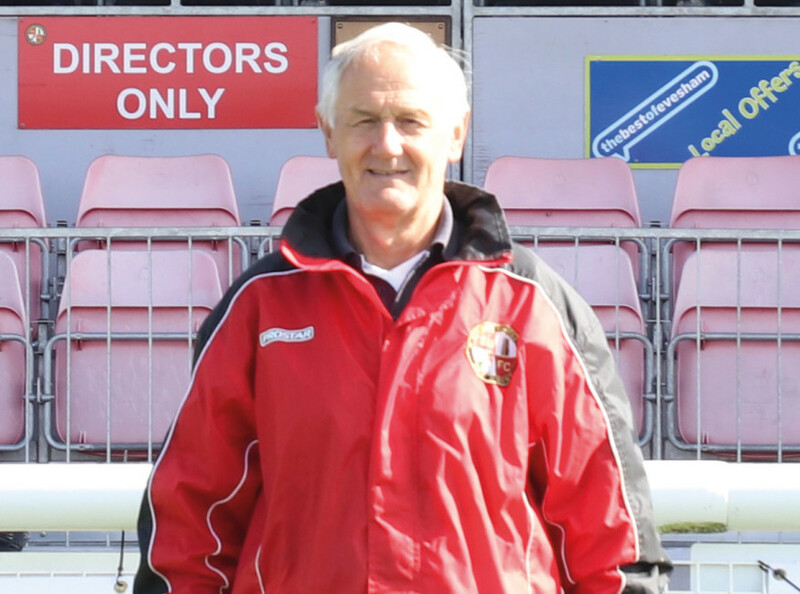 Proud to have gained Community Charter Standard Club status, Evesham fields a first team, girls eleven, two under U18s teams and U7s to U16s junior teams, "We have grown into a large club in a small market town," says Dave. "We are committed to providing football in the community 'for the community'. With more than 330 girls and boys playing football for the club, Evesham has achieved so much in such a short time, thanks to the commitment from local people." I catch up with Steve on the Friday before a busy couple of weekends' fixtures. 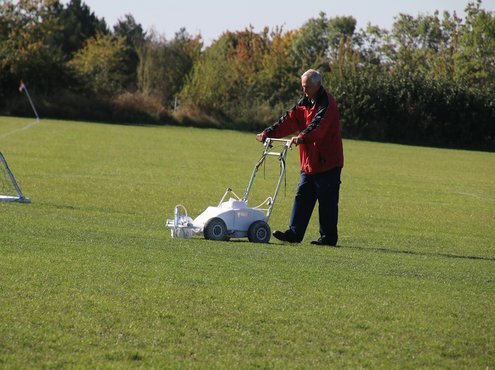 "I cut the stadium pitch on Monday ready for the U18s game in the evening and had fertilised it the previous week. The rain, then sun, gave the turf a growth spurt." Gloucester City use the Jubilee Stadium as their base too and usually alternate fixtures with Evesham. "This weekend it's us on the Saturday and Gloucester on the Sunday in a Cup game, with the fixtures reversed next weekend." "I'll walk the pitch on the Saturday, immediately after a game to check everything's in order for the Sunday. If there is no fixture, then I'll come in on Monday if the U18s are playing, or leave things until the Friday if the next action is the following Saturday." "I mow both ways, up/down and across - our chairman Jim Cockerton loves his stripes - with the Toro Reelmaster 2300D ride-on, which is smaller and lighter than the John Deere 3520 gang mower I use on the training and junior areas. Cut height has been raised to 35mm from 25mm formerly, since Gloucester City started playing here in 2007, after their old site kept flooding from the river." When you are a solo groundsman, time management is critical. "I have to prioritise my work," says Steve. He talks regularly with sports contractor Mowtech, who come on site to complete the more major aspects of the maintenance programme. "We decided to switch brand of linemarking paint, allowing me to get away with remarking the stadium pitch every two weeks. The new grade is a brighter white and a little more expensive than that we use on the other pitches." Even divot repairs, done manually, take a goodly slice out of Steve's schedule. "The main pitch is the priority. It'll take me a full hour if there's been only one game played, but two to three times that if I'm filling in after two fixtures." Now in its sixth season, the stadium pitch gives Steve a few headaches, as he explains. "I plan pitch renovation for immediately after the last game of the season. We don't Koro, but Mowtech verti-drain then blade slit the surface in the goalmouths, before reseeding and applying a light dusting of sand." The surface certainly needs refreshing after a heavy and intensive season of play on it. "Twenty-two finals [Sunday League and Worcester FA competitions] were played over the end of May to early June period this year," Steve reports. Conducted up to three times annually, verti-draining to three or four inches depth aids drainage issues, Steve adds. "Water can sit on top of the surface after heavy rain, but we deal with it. Twenty tonnes of sand were applied in the closed season. I use the dragmat to work it into the surface." 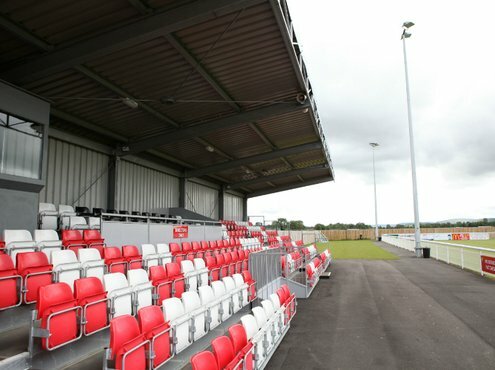 The 3,000 spectator capacity stadium is large enough to create damp areas, heightened when a portable stand is brought in for Gloucester City games. "Low winter sun and morning frost can create problems in front of the six-yard box. I'm looking at covering the affected areas this year." Steve moves on to mushrooms. "I think spores were imported in the topsoil applied to both the main pitch and training areas," he says. "In dry weather, the fairy rings appear. The cost of treating them would be prohibitive, so I cut to prevent spores forming." Given all the challenges that Steve faces as a solo groundsman, his biggest is the weather, he admits. Both playing areas are used so extensively that bad weather can wreak havoc to the maintenance programme. He needs to prepare the five smaller playing areas for the regular training for ages up to eleven on Tuesday to Thursday evenings, also checking that everything's in order for the first team training session on Wednesdays; "sometimes on the main pitch, or next door at other times", he notes. Extra floodlightss positioned on the stadium columns light the way for the juniors. At cutting time for the training areas, Steve brings out the John Deere, striping just one way to a 30mm height, then marking out as fixtures dictate. "Rain and sun have spurred on growth and I'll be mowing into November, if last year is any guide," he says. "We'll next apply granular slow-release fertiliser to both match and training pitches in one go, probably around Christmas time - two or three times a year is usual." This Saturday's shaping up to be a busy one for Steve. "All bar one of the junior pitches are in play - we'll have a fair few people on site. Security is part of my responsibility, although Gloucester City have their own personnel, and I'll be here first thing helping coordinate car parking. Two sides of the ground are taken up with car parks and can accommodate up to 350. "When we hosted the JPL [Junior Premier League] tournament finals last season, which kicked off at 9.30am and went through to 5.00pm, 900 cars came in." I wondered how the car parking will work when the 3G facility opens, and this is home to Evesham Cricket Club. Exciting times ahead for Steve for sure. Given its rural location, the club suffers less than you might expect from leaf drop in autumn. "Trees line the perimeter of the training pitches," says Steve. "Most are young and deciduous, but larger, more mature ones, overhang pitches 1 and 2, covering the 18-yard box on pitch 1. We have no blowers, so I use the dragmat to remove them." Without the extensive budgets of larger clubs, Steve has to negotiate new kit purchases. "I sit down with Jim regularly and he asks me what I need most," Steve adds. A third club plays at the stadium - Growers United FC. Launched in October 2012 by local horticulturalists Vicarage Nurseries, the initiative aims to raise funds for charity, promote horticulture and agriculture and "encourage integration between communities and cultures through sport". Employees there are well catered for with, amongst other facilities, a football practice area, so they can enjoy a little sport with their strawberry picking shiftwork. "We hire Evesham United's ground for fixtures," explains spokesman Vito Mauro, "and offer opportunities for businesses to cooperate in creating greater community spirit and cohesion." Charity football matches against TV Soap Stars, West Bromwich Albion and Liverpool Legends, have raised money for good causes, while 9-a-side 'World Cup' and 'Copa America' weekend tournaments have provided multi-cultural stages for football. Anxious to complete his preparatory pitchwork while the weather permits, Steve excuses himself. A once "temporary" position for someone outside groundsmanship is rapidly expanding into a full-on, pivotal position in the evolution of Evesham sporting hub. 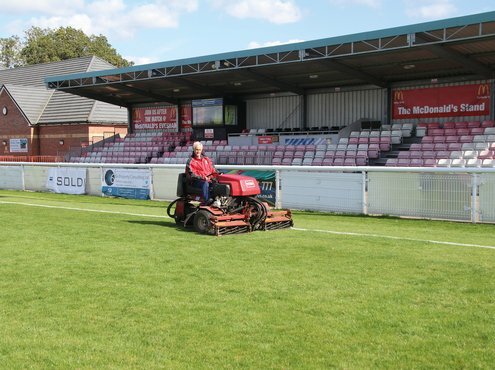 Modest about his key role in Evesham United FC's sporting delivery, Steve impresses you as a groundsman who can meet the demands and challenges of the turfcare maintenance programme.